Last week, provocative musician/activist Michael Franti spent two days meeting with World Health Organization (WHO) staffers and members of the United Nations. The meetings, which took place at the WHO Building at the United Nations Complex in Geneva, come on the eve of the release of Franti's latest album 'Yell Fire!' and his riveting documentary "I Know I'm Not Alone" which will both be released on Anti - Records on July 25. After a personal viewing of Franti's captivating documentary WHO staffer, Dr. Paul Kowal, was moved to invite Franti to be part of a panel on "The Human Face of Conflict and Health: Impact on Health Care Systems" at the WHO headquarters. 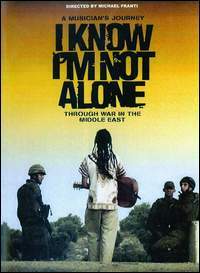 "I Know I'm Not Alone" chronicles Franti's journey to the Middle East in 2004 and features compelling footage of the war -torn nations that he visited and the effects that war has on the human population. "Although war is the most politically weighted subject one could ever take on, I did not want to make a political movie," says Franti. "Instead, I wanted to make a film about people, and the things they do to overcome the stresses of war and occupation: chief among these being friendship, humour, art and music." treated to a screening of "I Know I'm Not Alone" and a special two song performance from Franti including an unreleased song "Lifesaver" that was written while Franti was visiting Iraq. Over the course of the two day period, Franti also met with twelve WHO Health Leadership Fellows from Burma, Tanzania, India, Congo, Syria and other countries from around the world.